This is the article from www.7days.ae .I found it very good(all credit to the writer) and wanted to share with you. When India Test skipper Anil Kumble and his predecessor Rahul Dravid landed home in Bangalore a few days ago it was very easy to note that one was elated to be back while the other was disappointed at the very least. 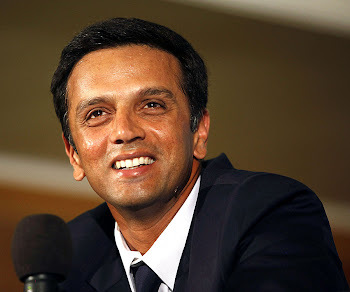 Kumble had announced his retirement from one-day cricket a little less than a year ago but Dravid had never intended to be out of the India squad that is currently taking on hosts Australia and their World Cup final opponents Sri Lanka. Surely Dravid must now regret his decision to give up the captaincy. He wouldn’t have been in this unfortunate position had he not done so. There have been days in Indian cricket when the captain has been told the bad news by the pilot of the plane taking the team to the next venue, after hearing a radio broadcast in the cockpit. In that instance there was even worse news on arrival when the man in question was named the 12th man as a ‘tribute’ to his acclaimed fielding.Things are nowhere near as bad now, but the selectors are still culling senior players in a way remeniscent of chickens who have contracted the bird flu. While the ostensible reason for dropping stalwarts such as Dravid and his predecessor Sourav Ganguly is the need to build a team ahead of the 2011 World Cup, there simply has to be something else to it.Looking to the future is never a bad idea but ignoring the present and forgetting the past is never a good idea. A healthy balance between youth and experience is always the key and this is a trick that the Dilip Vengsarkar-led selection committee have undoubtedly missed. If we were to consider each of their cases individually, there did seem to be a distinct decline in Ganguly’s one-day prowess despite the record number of runs that he rattled up since his comeback.Ganguly was always known for his striking power and never had an issue with his strike rate. But as we could all see in series against England, Australia and also Pakistan, the Kolkata left-hander was simply unable to up his rate even after he was well-settled. That he was batting as an opener - the best position to bat in an ODI - made it seem worse.But as far Dravid’s case goes, the injustice was more stark and continues to be so. He failed in the series against the Aussies but was quite a success in England before that. Also his failures came in various circumstances and different positions in the batting order. That the selection committee chairman had made it known subsequently that either Dravid batted at three or not at all is one of the more ridiculous suggestions ever made.Dravid has been highly successful batting at five and six. In fact his batting at those positions was what took the Indians through to the 2003 World Cup final. It just goes to show that in Indian cricket it is always possible to keep a good man down, especially if he himself has decided to step down from the top job.